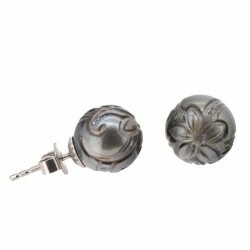 All the elegance and fashionable spirit of silver with the natural beauty of Tahitian pearls. Each pair is crafted in our workshop in France. 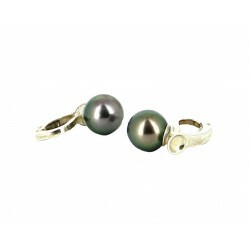 Choose your tahitian pearl earrings in either 18k gold or Sterling silver. Kasia Sterling silver earrings with circled Tahitian pearls.Circled Tahitian cultured pearl, 9-9.5mm AA+ qualityAll our jewelry comes in an individual jewelry box along with a GIA authenticity certificate. Emma Sterling silver hanging earrings with Tahitian pearls A stylized pair of Sterling silver earrings, with circled Tahitian pearls hanging from the bottom . Circled Tahitian cultured pearls, 9 mm AA+ qualityThe earrings are about 4 cms in length. All our jewelry is delivered in an individual jewelry box along with a GIA authenticity certificate. 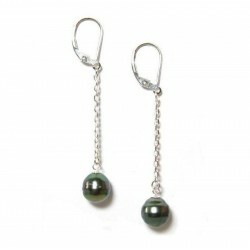 Tahiti Nui Sterling silver hanging earrings with Tahitian pearls. 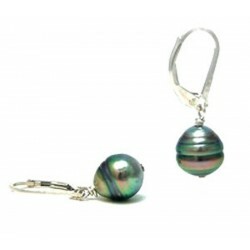 The Tahiti Nui earrings present a hanging design holding up two circled Tahitian pearls. The circled Tahitian cultured pearls are 8,5-9mm in diameter.The weight of the silver is 1.2g All of our jewelry comes in an individual jewelry box along with a GIA authenticity certificate. Lolani Sterling silver hanging earrings with Keshi pearls. Keshi Tahitian pearls hanging on silver venetian chain, with a butterfly back system.2g of Keshi pearlsSilver weight : 1.3g All our jewelry comes in an individual jewelry box along with a GIA authenticity certificate. 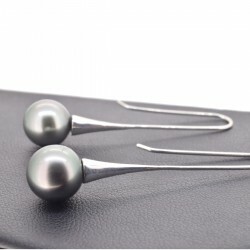 Half Tahitian pearl Sterling silver hook earrings. Our unique half Tahitian pearls mounted on silver hook earrings.A unique piece of jewelry.Half Tahitian cultured pearl, 9-10mm AA+ qualitySilver weight : 3g All our jewelry comes in an individual jewelry box along with a GIA authenticity certificate. Clips Sterling silver earrings with Tahitian cultured pearls. Clip on earrings with Tahitian cultured pearls.A confortable and solid fit for unpierced ears.Round Tahitian cultured pearl, 9mm AA+ qualityAll our jewelry comes in an individual jewelry box along with a GIA authenticity certificate. Hearts Sterling silver 92,5% earrings with round Tahitian pearls Two lovely Tahitian pearls hanging in Sterling Silver interlaced hearts earrings. Round Tahitian pearls, 9.5-10mm AA+ quality All our jewelry is delivered in an individual jewelry box along with a GIA authenticity certificate. 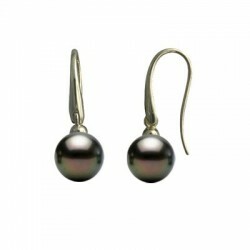 Mia Tahitian cultured pearl Sterling silver hook earrings.Magnificent Tahitian pearls attached to simple silver hooks. A simple, yet refined look.The earrings are 3.8cm long, pearls included.Round Tahitian cultured pearls, 9-9.5mm AA+ qualityAll our jewelry comes in an individual jewelry box along with a GIA authenticity certificate.